The Mirror online have run a lovely piece about Millpond and our new book: In the Night Garden: The Bedtime Book today, which you can see here. 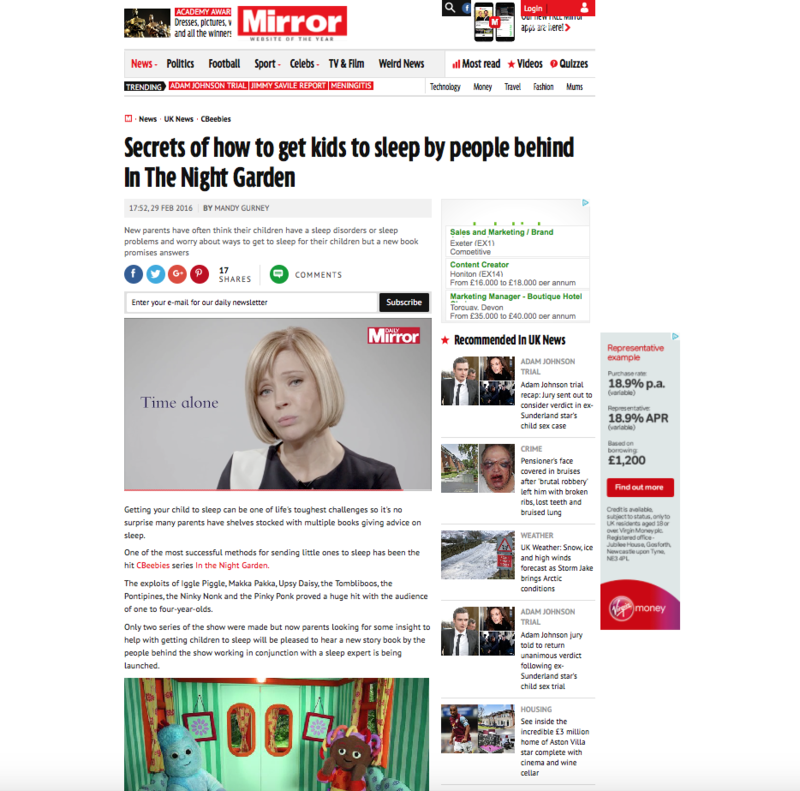 Millpond’s Mandy gives Mirror readers 12 excellent sleep tips and there’s even a video to watch packed with yet more advice on how to get your children to sleep. We are pleased to announce that we’ve been busy writing an innovative new bedtime book for children: In the Night Garden The Bedtime Book. It’s out now, published by Ladybird Books. We’ve written the beautifully illustrated book in lullaby-like language and created the story to help children recognise how natural the process of sleep is. For example, as Igglepiggle makes his way through the garden he comes across all the characters in the book settling down for sleep. This story about all their favourite In The Night Garden characters will reassure young children that everyone sleeps and that they should also take pride in being able to sleep well too. The rhythmic narrative is complemented by key repetitive phrases and suggestive words, such as “close your eyes” and “snuggle down” that children will find relaxing and suggestive of sleep. 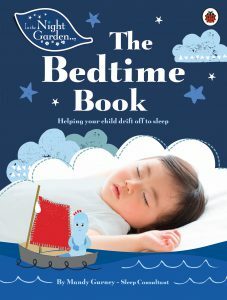 This book can be read every night as part of your regular bedtime routine with your child. We have included a specially devised relaxation technique to use after the story, which will banish even the most stubborn restless energy. The routine, story and relaxation work together to make a winning recipe for a good sleep every night. The book draws upon the tried and tested methods used by us at Millpond Children’s Sleep Clinic. A handy tool for parents trying to encourage their children to go to sleep, this In The Night Garden book is a new and essential stage in your bedtime routine. You can buy your copy here. We are very excited to launch the latest edition of our sleep bible: Teach Your Child to Sleep: Solving Sleep Problems from Newborn Through Childhood, which is priced at £9.99 and on sale now. There is one topic that preoccupies the thoughts of parents of babies and young children more than any other: sleep, and how to get more of it. Millpond Sleep Clinic believe that the solution to a sleep problem must take into account the particular family’s environment, composition, needs and expectations. Teach Your Child to Sleep follows a tailor-made approach: one that is sympathetic rather than prescriptive and that always has the child at its centre. Teach Your Child to Sleep acts as a guide which leads readers through the various practical options so that they can choose the right solution for their family’s needs. From your child needing a feed in the night to night-waking, this book covers a range of situations, using gentle and persuasive methods. By adapting the programme to your circumstances, good results can be observed within 2-3 weeks. All the techniques recommended in Teach Your Child to Sleep have been tried and tested at Millpond Children’s Sleep Clinic. Millpond has offered sleep training, with a 97 per cent success rate in resolving children’s sleep problems, and acted as consultants to NHS Trusts on sleep since 2007. Chapters Include: Understanding Sleep, Encouraging Good Sleep Habits, Understanding Sleep Problems, Tackling Sleep Problems, Identifying the Problem & Sleep Solutions.